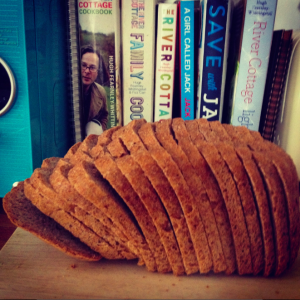 Ok, I promised that I would share my recipe for bread didn’t I? Now I don’t want you to be shocked at how simple it is and dismiss it – give it a go and see if it will work. What makes it even more simple is that the same recipe can be used for rolls and pizza dough, it can be used for hand baked bread or in a bread maker . Once you memorise it, and it’s easy to do that, you’ll find that you can always whip up some dough or a loaf of bread without any fuss. As you can see in the picture I’ve even tried this with wholemeal flour and made a great loaf (in my Panasonic bread maker) – normally I have to add slightly more water though but the simplicity is still there. That’s it. No sugar, no oil, no vitamin C tablets, no milk powder. Nothing. All you need to do is mix it all together and knead the dough (I normally throw mine in the bread maker and let it do it’s thing on the bread dough setting). Once the bread dough has risen, punch it back down and place where you’re going to bake it. Either shape it into a loaf or put it in a bread tin. Leave to rise once more and start heating your oven up to 220C. Bake for around 25-30 minutes – depending on your oven. It’s ready when it’s all golden brown and is hollow sounding when you tap on the bottom. I’d love to know if you try out this recipe – do let me know in the comments what you thought of it and whether it made good bread! ← What are the best flour storage containers?